One day, three men got in an accident at a stoplight. 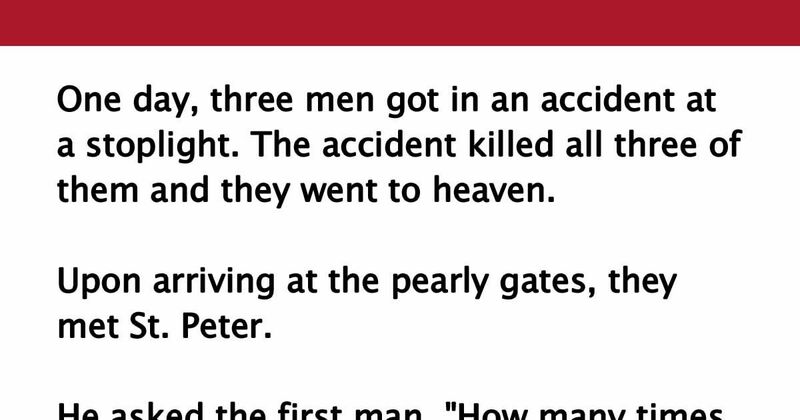 The accident killed all three of them and they went to heaven. Upon arriving at the pearly gates, they met St. Peter. He asked the first man, "How many times have you cheated on your wife?" "Three times and nothing more," the man replied. So St. Peter gave him a very small, used car, sent him back to Earth, and told him never to cheat. St. Peter then asked the second man, "How many times have you cheated on your wife?" "One time and nothing more," the man responded. St. Peter gave the second man a decent, mid-sized car, sent him back to Earth, and told him never to cheat. Finally, St. Peter asked the third man, "How many times have you cheated on your wife?" "I have never cheated on my wife all my life," the faithful man answered, proudly. St. Peter rewarded the last man for his loyalty. He gave him a brand new Cadillac with all the luxury features he could want, then sent him back to Earth. One day, the three men, who had all been through the same experience together, decided to meet up and have a drink together. As they were talking, the man who had gotten the Cadillac suddenly started crying. The other men couldn't understand why he was crying, so they asked what was wrong with him. "I just saw my wife pass by on a skateboard," the man sobbed. Oh dear. LIKE and SHARE this one on Facebook!